Kissimmee, FL - August 17, 2010 - United Foam's Kissimmee, Florida, location has added water jet cutting capabilities to its foam fabrication operations. This new capability greatly expands United Foam's south east operations by increasing manufacturing output, incorporating new materials, servicing new applications and providing additional value to its current customer base. The addition of water jet cutting to United Foam's Kissimmee operations increases production by up to multiple-thousands of parts per week (depending on the project). 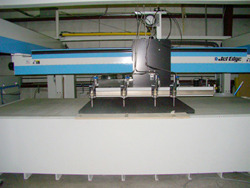 The new water jet cutting capability compliments United Foam's Florida's current operations which include CNC routing. In comparison to routing foam, water jet cutting provides much tighter tolerances resulting in extremely detailed parts. Utilizing a water jet cutter as apposed to a routing machine, when fabricating a foam insert, enables more cavities per insert and can reduce the overall size of a packaging system or component. 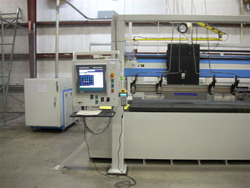 United Foam now has water jet cutting capabilities at three of its ten fabrication facilities. With the addition of this capability, United Foam's Kissimmee location can now fabricate reticulated polyurethane foams for the first time. Reticulated polyurethane foams are an open cell material featuring high tensile, elongation and tear characteristics. This family of material is ideal for fabricating solutions used for filtration, sound absorption, insulation, fluid management and gasketing. The addition of water jet cutting to Kissimmee enables United Foam to further service a number of its key target markets including Aerospace & Defense, Computers & Electronics and Industrial. Water jet cutting is ideal for fabricating solutions such as tool control to prevent FOD (Foreign Object Damage), inserts for protective cases and components made from reticulated polyurethane foams. United Foam, a UFP Technologies brand, creates high-performance packaging, part and product solutions from an array of foams, plastics and specialty fabrics. Using the industry's most advanced materials and conversion techniques, we engineer unique, cost-effective, solutions for a vast range of critical applications. We have ten fabrication facilities located throughout the US.